Reveal Mobile Forensic Evidence Drying Cabinet - 48", Single Door. 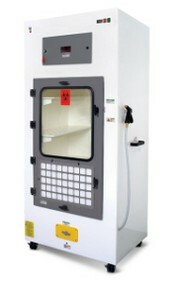 Being able to prove the integrity of evidence is important in court, and the Reveal Mobile Forensic Drying Cabinets provide a secure location for drying or storing evidence, with tempered glass doors with key lock, tamper-proof seal, and space for adding kraft paper to catch trace evidence that may fall from wet evidence. The polypropylene shelves are perforated for superior air circulation and can be installed or removed using one hand. Reveal Mobile Forensic Drying Cabinets require little in the way of site prep. The 8’ outside sidewall hose may be connected to an external water source and is located away from walking areas for added safety. Standard tap water provides the recommended amount of water pressure. Inside, an internal wash-down spray hose helps prevent contamination of future evidence, and a centrally located 1.5” bottom drain with anti-siphon trap allows for easy waste water removal and cleaning of the drying cabinet. This drain does not require a fixed location and can be used with a standard sink or floor drain or a generic container. A manual open/close drain valve is located on the front of each cabinet. The standard airflow on the Reveal drying cabinets is an upflow method, allowing room air to be pulled into the unit through the electrostatic pre-filter located in the doors, across your wet evidence, and into the dynamic filtration system. Here, in the filtration chamber rests an all-purpose, activated carbon filter designed to remove contaminants before the air is released harmlessly back into the laboratory, providing the cleanest air available in the industry.